So Microsoft finally revealed latest Xbox spec. From first look Ps4 got better Ram which is quite important for high performance in video games. 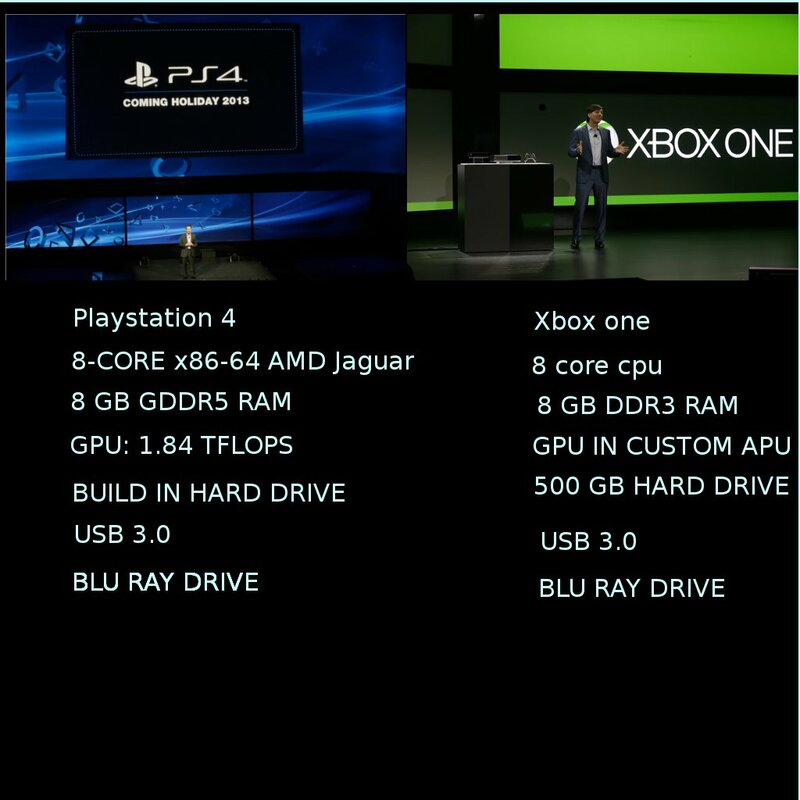 Apparently Xbox one GPU is only 1.2 Teraflops comparing to 1.84 from Ps4, however I am not certainly sure about this. Having really powerful machine does not always guarantee a good reliable software/video game. Developers need some time to learn how to speak to new hardware and it might take few years until they will be able to use the full power of both platforms. I still can remember 1994 when games for Ps1 looks totally different than the ones from 1998, still the same hardware but developers mastered it. I am not a huge fan of Xbox as Microsoft Xbox division think it's fair to rip people off, however I have to say that even with worse specs Xbox might have some better games at the beginning of the new console generation race, correct me if I am wrong. Let's hope so I am wrong as I much prefer Ps over xbox (I have both) for many reasons. So I personally think that both consoles got the same chance in the new race for victory, however developers will have huge impact on consoles success. We want to be able to export some information to Excel file or CSV file. We are going to create a simple class that will hold basic Client information (First name, last name, Date of birth and Email) and we are going to populate it with some dummy data to display it on a View (table) and then export it to Excel/CSV. Within your new ASP.Net MVC (lets name it ExportToExcel_PDF_CSV) application in Model folder create a new class and call it ClientsList.cs. Now in Home controller we are going to populate this class with some data. Make sure you instantiate this List within class so it will be available in every method in this controller. We are going to display data that came from controller and model we are using is List<ClientsList>. Add some styling to your Site.css style sheet. In both cases we are using HttpResponseBase (Response) and stream writer. In excel export we are using grid, so we can bind data to it.